Originally built as a gateway to space colonization, Biosphere 2 has a new purpose: to breed supercorals strong enough to survive swiftly changing seas. First, scientists must revive the simulated ocean. The shimmering scree outside the University of Arizona’s Biosphere 2 was last covered by seawater around 100 million years ago. Today, the sparse vegetation slung over the dusty former seabed is parched by temperatures that climb to 43 °C. Inside, though, an ocean laps at rocky shores and an army of air handlers maintains a temperate climate. A machine stirs a current across the saltwater surface, and light zigzags through a glass ceiling. Amid the hum of pumps and piping, living things rustle. From the beach, I watch black long-spined urchins wave their spikes, all slow-motion prickle and sway. Iridescent top-crown snails rove across a nearby rock. The lump of coral in my palm, though, died long ago. Its bleached, honeycombed surface is grippy and feels like bone. 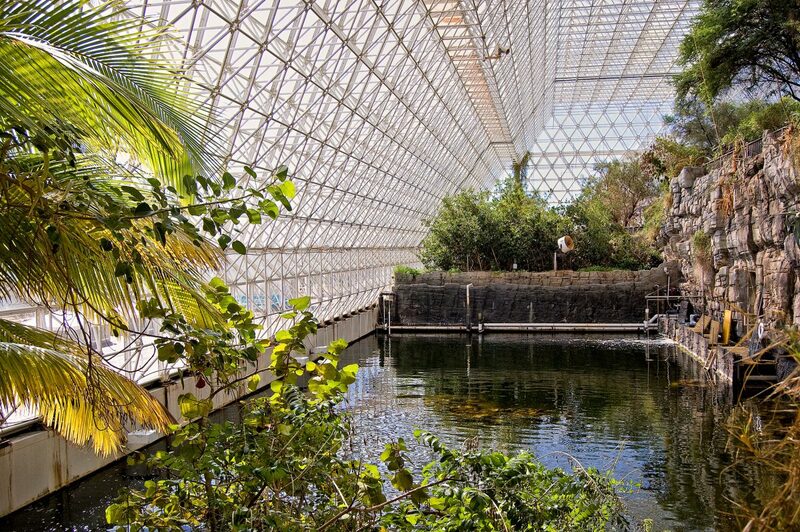 Biosphere 2—part space station, part earthly tangle of ecosystems—is a research facility in Oracle, Arizona, that houses manufactured Earth systems from around the globe. Within the futuristic, 1.3-hectare conservatory, a leafy rainforest percusses with dripping rain. In separate sections, mangroves grow like slow-moving men on stilts and a boojum tree muscles out of a fog desert. Billabongs and glittering quartzite boulders punctuate an enclosed savanna. The artificial ocean at my feet swells with more than two and a half million liters of seawater, enough to fill an Olympic swimming pool with plenty left over. 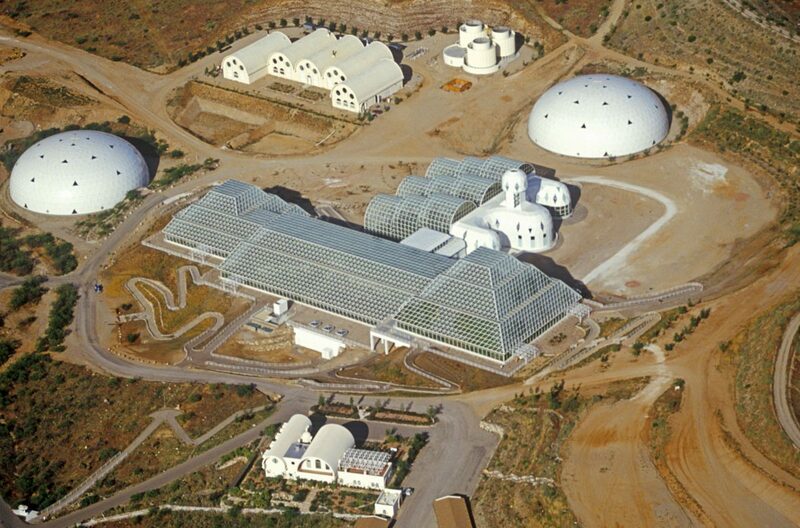 Biosphere 2’s strange origins and futuristic ambitions can be traced to the end of a dirt road in the mountains of New Mexico. While visiting a quasi commune called Synergia Ranch, Texas billionaire Edward Bass and ranch founder John Allen began dreaming of an enclosed ecosystem that could support human life. The possibilities seemed expansive: the ability to create a habitable, self-sustaining bubble could allow humans to survive on other planets. Inspired, Bass eventually put up an initial US $200-million to fund the project. 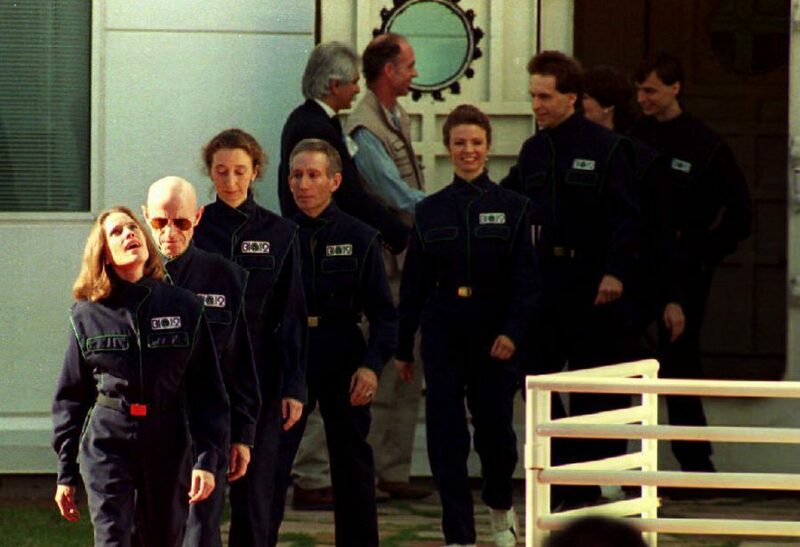 In the early 1990s, a team of eight researchers stepped through the airlock and sealed themselves inside the glimmering, new complex to see if the manufactured world under glass could keep them alive. The Biospherians lasted two years, as planned, though needed to have oxygen pumped in. During that mission, a living coral reef thrived underwater, colorful and diverse and very different than the pale and pockmarked lump in my hand. When a second mission shut down early, Bass handed the facility over to New York’s Columbia University, and researchers turned their collective gaze from the possibilities of space inward, toward the health of our own ocean. During this era, Biosphere 2’s artificial sea became an extraordinary model for the effects of ocean acidification. Columbia University researchers showed that when carbon dioxide levels rise, ocean pH plummets and corals and other calcareous organisms perish. It may have been the most groundbreaking marine research of the early 21st century—much of what we know about ocean acidification we learned from Biosphere 2. Columbia University stepped away from the facility in 2003, leaving behind a reef degraded from the acidification experiments. The University of Arizona took over in 2007, and now owns Biosphere 2, but during those lost intervening years, the ocean tank stagnated and grew brackish and the reef eventually died from neglect. The only living relics from the original reef are a few hardy yellow tang that still wander against all odds in the murk and among the acidified skeletons of the reef. Now, the University of Arizona is coaxing the Biosphere 2 ocean back to health for what might become one of the boldest climate change experiments of our time. In the middle of the arid Southwest, in an artificial sea, researchers are readying the waters for a new wave of life. Their mission: to save the planet’s corals from extinction. In the years since ocean acidification damaged the facility’s reefs, we’ve learned that rising CO₂ levels are only one of many climate change challenges under which the planet’s coral reefs are straining. 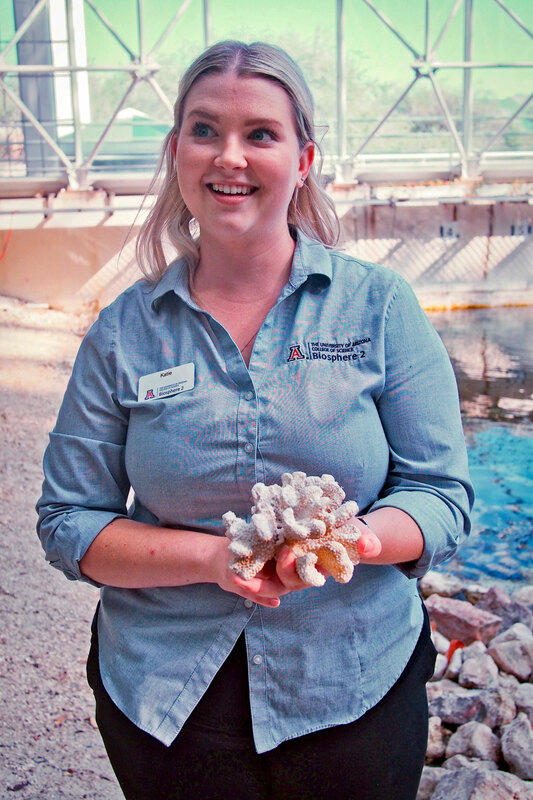 Paleoecologist Julia Cole, who recently left her role as research director for the ocean at Biosphere 2 to become a professor at the University of Michigan, studies the history of climate change and understands the ways in which our future is interlocked with the future of corals. We rely on reefs as massive food banks, as storm protection, and as economic goldmines for underwater tourism. Recent years of warm marine temperatures have jeopardized “virtually every spot in the ocean,” Cole says—a situation that has pushed corals to expel the life-giving single-celled algae that live symbiotically inside corals’ tissues. Without those algae, corals bleach, losing their color and losing access to the photosynthesized sugars that help them thrive. Stressed corals can sometimes rebound, but often the majority of a bleached reef will die. “It’s really reached a tipping point the last few years,” Cole says from her desk during a Skype interview following my visit. She speaks animatedly with her hands, lending a sort of physicality to the urgency of the situation. “Right now it feels like do or die.” At Biosphere 2, Cole hopes to assemble an emergency response team, bringing together scientists from around the world to breed “supercorals” that can resist the ravages of climate change. In time, if the strongest corals can be selectively bred or perhaps even genetically modified, then researchers at Biosphere 2 might essentially hold the seeds for the future—seeds (or polyps, rather) that can be planted in places that might otherwise lose coral reefs entirely in the coming decades. It’s an ambitious vision, and it’s possible that no other place on the planet has the capacity to house the scope of work that’s about to unfold here. Similar coral breeding projects in labs elsewhere don’t offer the space or complexity that Biosphere 2 can; conversely, a trial in the actual ocean could have dire consequences. Nobody is in a hurry to introduce genetically modified species into the sea before knowing how they’ll interact on an ecosystem level. “This is the place where unusual things can be done,” Ruth Gates, director of the Hawai‘i Institute of Marine Biology and a research collaborator at Biosphere 2 said when I reached her by phone. Here, “you can test things at the extreme end of the intervention portfolio … because there’s no risk to it.” Gates recently passed away, leaving the fate of supercorals to her fellow researchers. For them, the enormous Biosphere 2 tank will become a unique bridge between small-scale laboratory tests and real-world field studies. On an earlier visit to Biosphere 2, I wandered past old airlocks and tasted a mixture of metal and salt in the air. At one point, I passed a stack of purple and white boxes branded “Instant Ocean”—some of the 32,000 kilograms of salt that continue to be spilled, bagful by bagful, into the neglected ocean tank to resalinate the water. The white crystals contain all the invisible ingredients that an ocean needs: calcium, magnesium, potassium. However, the scientists know that the kind of “instant ocean” they’re striving toward can’t simply be poured from bags. Much like the architectural finesse that corals themselves employ as they build reefs—polyp stacked upon polyp like stones in a castle—the project at Biosphere 2 will involve an exquisite and tenuous act of engineering. In the coming half a year, narrow, rectangular runways of water will be installed in a laboratory setting where corals can be isolated and manipulated outside of the bigger ocean system. In another year and a half, when the time comes to introduce corals into the main tank and crank up the heat, the future of the project will depend on the voices that speak up to steer it. An international team of engineers and microbiologists, chemists and biologists, paleoecologists and aquarists will collaborate to come up with creative questions. It is a deeply human urge to engineer our environment—to solve problems or harness nature for our own purposes. At Biosphere 2, though, the engineers won’t all be human. At the sandy beach, I set down the dead coral I’ve been holding and squat at the water’s edge, letting a hermit crab explore my palm. I can feel the precision and tickle as each claw navigates across my skin’s topography. This delicate crab’s work is mighty: to set a livable stage for supercorals. Scuzzy algae have overtaken the tank, and a complex cast of creatures is necessary to transform it back into an ocean in miniature. Thousands of red-legged hermit crabs, oysters, urchins, and top-crown snails—all recently released by hand—are working full-time to graze, while filtering the algal haze. Rainbowed bands of sediment, seen in cross section at an underwater window, indicate that brightly colored bacteria are at work recycling nutrients. The crab and his companions are doing what organisms in wild ecosystems do: cleaning, recirculating nutrients, maintaining balance. I set the crab down. In this strange microcosm of angular windows and machine-powered currents, I wish the little animal luck in the engineering burden that it unwittingly bears. It is a sentiment that he shares with Cole. The decision-makers at Biosphere 2 recognize the need for more sweeping answers for climate change. They recognize, too, that now that we’re on the brink of what some scientists have called the sixth extinction, corals don’t have the luxury of biding time for those bigger cures. In a facility like Biosphere 2, it’s hard not to think of The Martian and the engineering and ingenuity necessary to coax familiar things to life under hostile new conditions. The team at Biosphere 2 may not have utilized space travel, but it is pushing nonetheless toward uncharted horizons. Ultimately, the success of the project might depend on the collective imagination of the team—finding solutions for a rapidly changing sea will call for brave acts of inventiveness alongside the precision and restraint usually associated with science. As I finish up my conversation with Cole, she reflects, “The whole existence of the biosphere … was a massive group act of creativity.” All these years later, it would seem that creativity will still be the driving force as world builders from all disciplines convene far from the nearest surf break to throw a lifeline out for corals. Hannah Hindley is a wilderness guide and nonfiction writer. 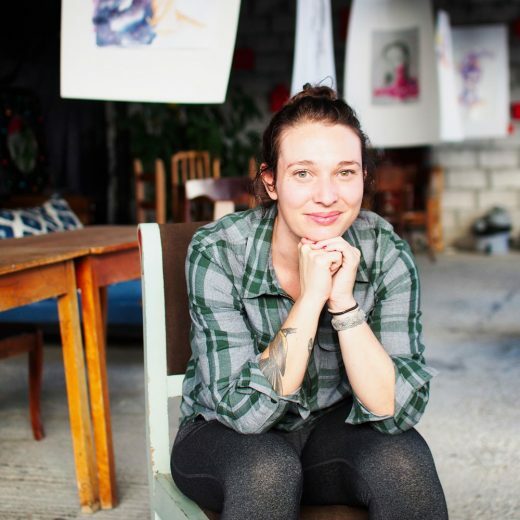 She is the recipient of the Thomas Wood Award in Journalism from Harvard University and the former writer in residence at the Sitka Center for Art and Ecology in Otis, Oregon. Her writing can be found in journals, anthologies, and newspapers, including River Teeth, Terrain.org, Harvard Review, and the Press Democrat. Cite this Article: Hannah Hindley “Instant Ocean,” Hakai Magazine, Nov 13, 2018, accessed April 26th, 2019, https://www.hakaimagazine.com/features/instant-ocean/.